Good Morning Britain has been blasted by TV viewers for dropping the news of the Las Vegas shooting on Mariah Carey during a live interview. On Sunday night (01Oct17), more than 20 people were killed and over a hundred injured after a gunman opened fire while concertgoers were enjoying Jason Aldean's set at the Route 91 Harvest outdoor country music festival near the Mandalay Bay Resort and Casino in Las Vegas. The We Belong Together singer had been due to appear on the British show via a video link from her Beverly Hills home to promote her upcoming Christmas tour on Monday morning U.K. time, when the shooting was still ongoing. However, instead of doing the planned promotional chat, she was asked by co-hosts Piers Morgan and Susanna Reid for her reaction to the shooting, and it was clear by the shocked expression on her face that she had no idea about the unfolding situation. Calling the tragedy "horrible", she said, "I pray for the victims" before asking if the shooter had been caught, while incongruously reclining in a red gown on a sofa with a Christmas tree visibly in the background. After the hosts filled her in more about the situation, the singer, who recently finished her residency in Las Vegas, replied, "Wow, that's awful. Again, I pray for the victims and hope all these can stop as soon as possible. You know I have spent a lot of time in Vegas and this type of thing happening anywhere is a huge tragedy. I continue to pray for the victims. I hope we have an end to this as soon as possible." Piers then interrupted the chat so they could go to an advert break and said they would be back with Mariah afterwards, but she never returned. 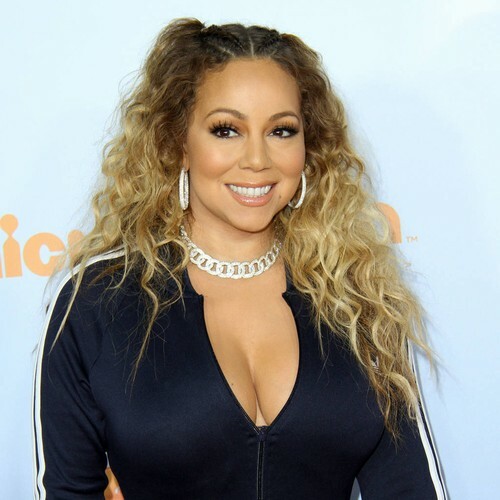 Viewers took to Twitter to blast the bizarre interview, with one writing, "So tasteless breaking the Vegas news to Mariah Carey live on TV, shame on you," and another added, "How could Mariah Carey or any of her team not know about Las Vegas b4 goin live on @GMB ?? Not fair on her or anyone to be told live on tv!" Minutes later, Mariah posted her condolences on Twitter, writing, "Horrified to hear about the shooting in #LasVegas. My thoughts are with the victims and their families. Praying for everyone's safety."